Advantage Aqua for dogs provides fast relief from fleas. Inhibits the growth of flea larvae to prevent future infestations. 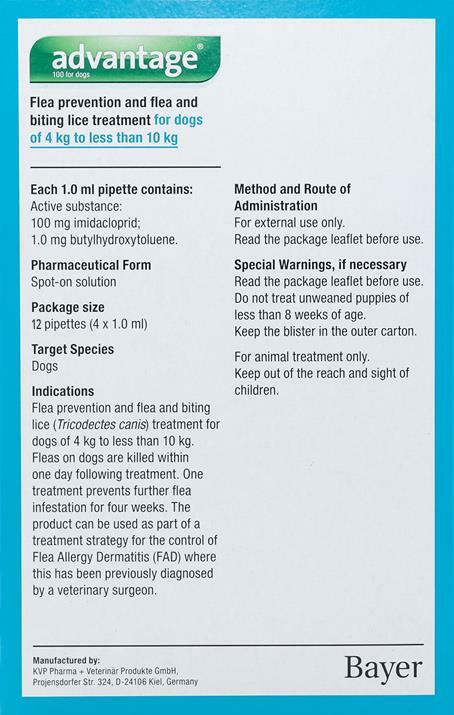 Perhaps the most impressive feature of this treatment is the ability to kill fleas on contact and not only when they bite your dog. Advantage offers consistent unyielding flea protection for one month per application.. I am looking at the advantage aqua dog is that just for certain breeds ? No you can use Advantage on any breed. Advantage is a great product. It works for both ticks and fleas. Each tube protects your dog for a month. We have a 22lb puppy and is 3 months old.... Is that medicine good to give him? You can use this product safely on puppies who 8 weeks of age or older. I have a 8 pound and a 9 pound dog, can I use the same dosage of Aqua Advantage for 8.8 pound dogs on both or do I have to buy 2 differeent dosages? or the weakest dosage. Advantage Aqua should be ok for both of your dogs. Excellent! I have used this product on both of my pugs for their entire life. One is 13 y/o and the other is 15 y/o. We have NEVER had flea problems and they have experienced no side effects from this flea prevention. Highly recommend! Very happy with the product. Would like an option to have it delivered faster, took a little more than 2 weeks.